Kendall Loh/Photo Editor Harpur’s Ferry corps members pose in front of an ambulance. Harpur’s Ferry won the Advanced Life Support (ALS) skills competition for the second year in a row. The ALS competition is part of the National Collegiate Emergency Medical Services Foundation Conference, which took place in Boston from Feb. 28 to March 2. Binghamton University’s student-run ambulance corps, Harpur’s Ferry, won the Advanced Life Support (ALS) skills competition for the second year in a row. The ALS competition is part of the National Collegiate Emergency Medical Services Foundation Conference, which took place in Boston from Feb. 28 to March 2. Harpur’s Ferry members Nathan Toussaint, Rebecca Schwartzman, Devin Howell and Alexander Nello competed against EMS teams from colleges and universities around the country. Harpur’s Ferry won the ALS skills competition three years in a row from 2005 to 2007, and they won again last year. The skills competition consists of three scenarios in which team members must work together in an efficient and timely manner. During the medical and trauma scenarios, teams were given a fictional patient and had to find out what was wrong while keeping the patient alive with medications and medical techniques. Competitors worked on test dummies, which replicated symptoms and medical issues. Harpur’s Ferry diagnosed a 30-year-old woman with a collapsed lung. In the team-builder scenario, teams were presented with a non-medical problem, testing the team’s ability to work together, with points awarded based on creativity. Teams were also given a trauma scenario where they had to attend to a female patient. In preparation, members representing Harpur’s Ferry practiced medical scenarios to review their skills and practice their communication. However, they mostly relied on the combined experience they have gained as medics and as a team. Nello, a second-year graduate student studying biology, attributed Harpur’s Ferry’s repeated success at the ALS skills competition to the extensive training that members undergo. To take part in the ALS skills competition, participants must either be an Advanced EMT-Paramedic (AEMT-P) or an Advanced EMT-Critical Care (AEMT-CC). Advanced EMTs may practice more invasive techniques on patients, such as inserting an IV. Toussaint and Schwartzman are AEMT-Ps, while Howell and Nello are AEMT-CCs. Most members of Harpur’s Ferry are EMT-basic: They may administer basic medications such as EpiPens. According to Nello, only 10 to 15 members of Harpur’s Ferry are ALS providers. 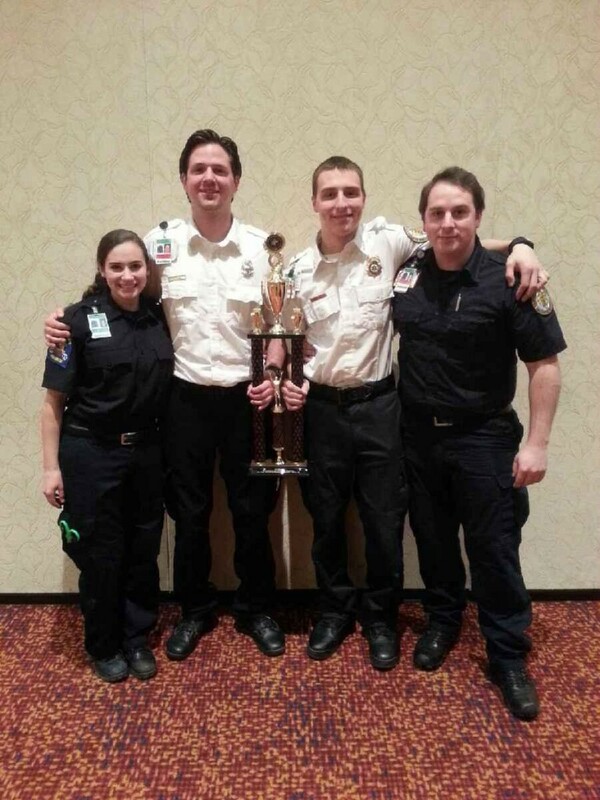 As winners of the ALS skills competition, Harpur’s Ferry will be competing in the next Journal of Emergency Medical Services (JEMS) Games in 2015 at the EMS Today Conference. Teams from around the country and overseas participate in the competition in which they must save a fictional patient in the shortest amount of time. Howell, Nello and Toussaint were part of the team that competed in last year’s JEMS Games. Schwartzman, who graduated from SUNY Cortland in 2011, first started working with Harpur’s Ferry during her senior year to help with flood relief and has been a part of the ambulance corps ever since. According to Toussaint, the best part of the Harpur’s Ferry team’s victory was the chance to compete with friends.